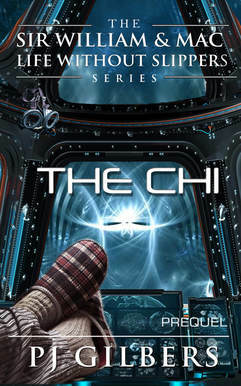 Relationships, even in space, can be tricky, but receiving your free copy of The Chi, the prequel to the entire Sir William & Mac Life Without Slippers Series, is easy. Place your email below. Meet William, he liked being a space garbage pilot but now he's been given a job that 89 people attempted but failed. He's number 90 and he never knew he was even in line. Humor, intrigue, lost loves, ice queens, old warriors, and a photon monster that is chomping on William’s home planet. The Mac, the first book in this new science fiction humor series is now live on Amazon, Kobo, and Nook B & N.
The Chi is available to our friends who join us, living the life in slippers. Coming this winter is The Bokor. When you sign up you will be entered in a drawing for The Bokor.